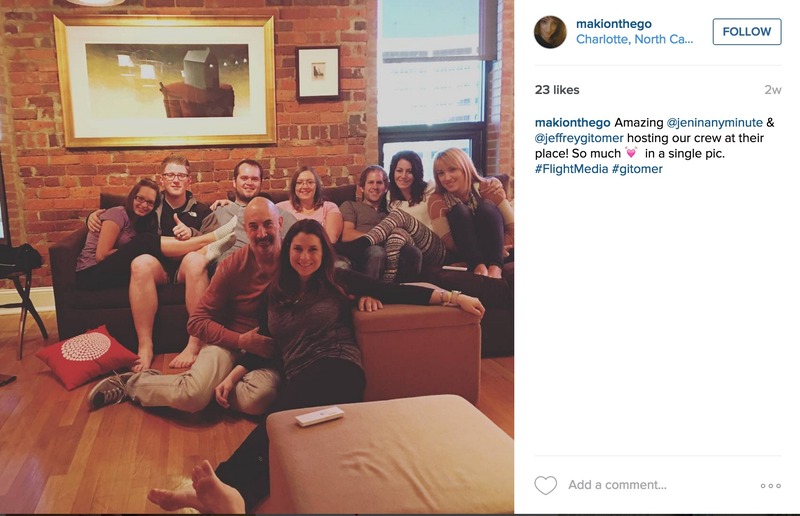 Team-building content let’s prospects and clients know your team works well together. Progress content let’s your clients and prospects know that you’re a healthy company, determined to succeed. Funny content creates an emotional connection with your audience. Personal content shows that you’re relatable. If you’re used to reading the Flight Media Blog, then you know we preach that your content needs to provide value and serve your audience. Positioning yourself as a provider of value is what brings the boys to the yard — or sales to your wallet. Why? 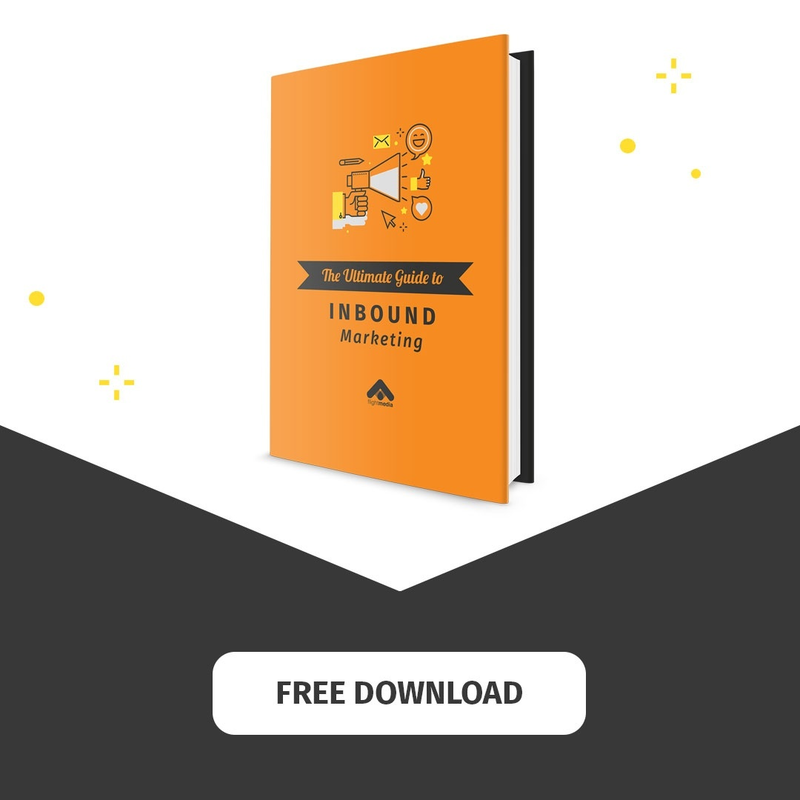 Because value-driven content builds trust, sparks relationships and grows deep connections with your prospects. But don’t use the content to solely talk about yourself or your products/services. 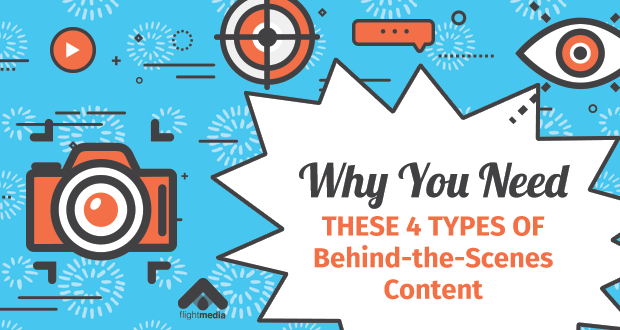 Outside of the 4 common types of content to post — internal, external, promotional, and inspirational — you’ll find another very important type of content you should develop. Shows that you have fun. Reveals your love for your team. shows you make mistakes, but you also laugh and live. And in order to build relationship and trust, this kind of content is a necessity. You see, people want to connect to other people, not brands. That is where behind-the-scenes content takes center stage. And according to our findings — we tested this with dozens of our clients — the audience LOVES the show. Think about it, don’t YOU love it when you get to see how your favorite show was filmed? Or how much fun they had at the shooting of your favorite brand’s commercial? It feels human, down to earth, and close. It triggers actions – liking, sharing, and commenting. That sort of engagement shifts viewers into another role: that of a promoter. And that’s exactly what every business needs. Now, it’s time to implement the strategy and boost your social presence. Here are the four types of BTS content that you can post. Prospects and clients will be thrilled to know that your team works well together. Creating a culture of friendship and appreciation leads to synergy in everything you do. Showing that you nurture close relationships and a family-like environment will attract clients who share the same values. And it will reassure current customers that they’re in the hands of a team that loves what they do. This is a great way to show the character of your company. Are you smiley face people? Goofy? Super fun? Or are you more of a serious crew? Both are OK and have audiences of their own. Think about your buyer persona and the type of customer with whom you want to connect. And always, always be genuine. Share progress and success. New offices, certificates, trainings, and workshops — show it. Investing in your team is sign of a healthy company determined to succeed, so why not highlight these accomplishments? 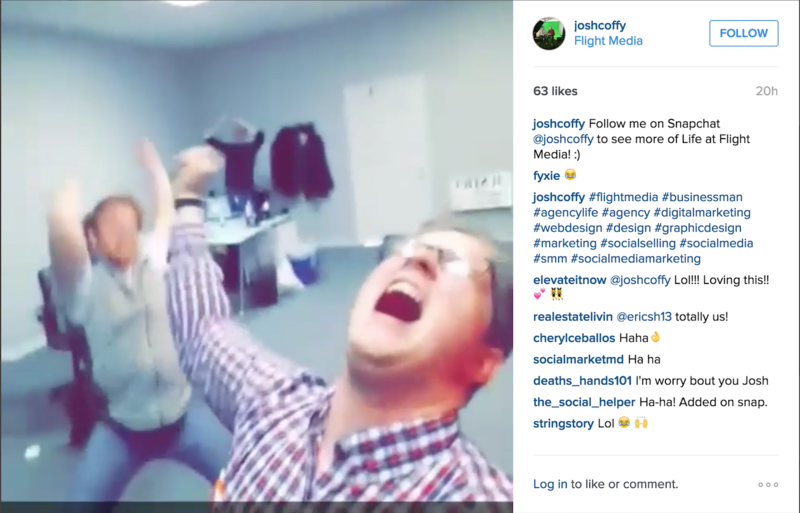 This kind of content will have a great impact on your prospects, and your employees. Make sure to tag them, praise them, and share the company’s growth with them, as well. The team will feel appreciated and involved, thus creating a better environment and becoming even more productive. Everyone loves to laugh. If you can make prospects and clients laugh, you’ll create an emotional connection with your audience. According to BuzzSumo, funny content ranked in the top three kinds of posts that elicited an emotional connection with people. Turns out, people share this kind of content more than others — so start making your audience laugh! Use humor in social media posts to brighten your prospects’ day and deepen your relationship. Posting only business-related content is simply boring. If you persist in doing so, people that engage with you on different channels will start to tune out, as the content is not diverse, human or entertaining enough. No matter the niche you’re in, your content needs to include personal posts. Choose the right platform to publish BTS content, and you’re golden. Twitter is an awesome tool for sharing BTS content. However, be mindful of the format. While images are welcomed at this platform, you might want to hold off of on the videos. You have invested significant effort into creating a video so it’s better to promote it on Youtube or Facebook, where it can reach a larger audience. Remember, Twitter is super fast-paced! Chances are, your video won’t have the reach you desire. You can use Twitter to drive traffic to it, though! Unfortunately, you can’t outsource the creation of BTS content. So don’t try it. It has to come from you, your company and your employees, as you are the people in the field. So pull out your phone, snap a pic or two, and send them to your marketing department. So go ahead: Show your culture, values and spirit. Your audience will love it — pinky swear! Are you including these kinds of content to make your business more relatable to your audience?